Published: Mar 16, 2019 - Modified: Apr 17, 2019 - by Chef Rodney - 2 Comments - This post contains Ads & Affiliate Links. Cheeseburgers are the cornerstone of American food. Some people like their cheeseburgers with bacon while others like the full works including tomatoes and pickles. And what’s a good cheeseburger without a side of tasty fries. Now can you imagine a casserole that tastes just like a bacon cheeseburger with fries? Too good to be true? Nope. This casserole recipe tastes just like a cheeseburger with fries! My father cried when I said I wanted to be a chef. What I love about this recipe is its simplicity. A few ingredients you probably already have in your pantry and about 1 hour of your time. My wife said that it reminded her of her childhood with her parents would make cheeseburgers. I think the Velveeta we melt with the meat gives you that childhood memory of processed cheese on a burger. The Tater Tots come out super crunchy as they should. We wanted our cheeseburgers to have all the fixings like tomato, pickles and onions but you can omit those final ingredients if you feel like it. Either way, if you love cheeseburgers, you won’t be disappointed with this dish. 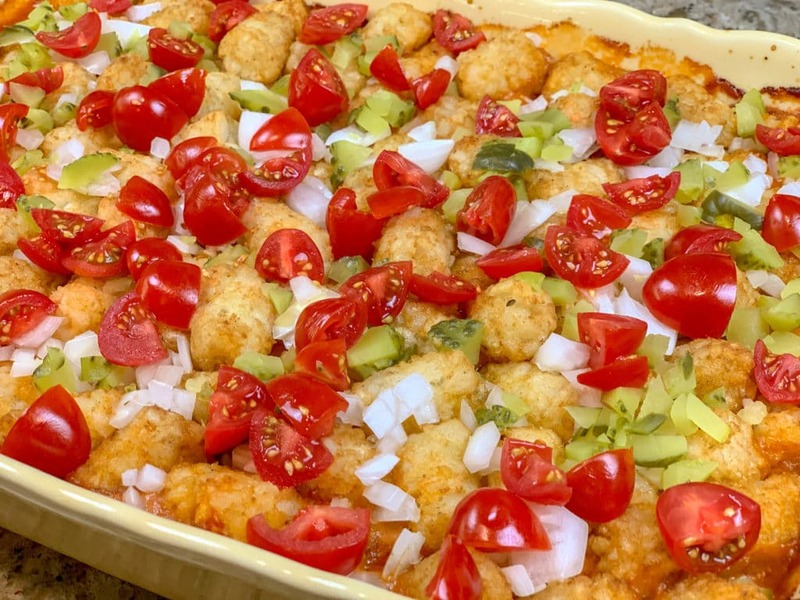 If you are looking for an easy to make casserole that can feed a bunch of hungry people, then this recipe is for you. In a large skillet over medium heat, cook ground beef and 1 cup of the diced onions, until the beef is no longer pink and the onion is tender. Drain fat from skillet if necessary. Stir in tomato sauce, Velveeta cheese, ground mustard and Worcestershire sauce. Stir occasionally until cheese is melted. Transfer meat mixture to a greased 9 x 13 baking dish. Sprinkle with shredded cheddar cheese and crumbled bacon. 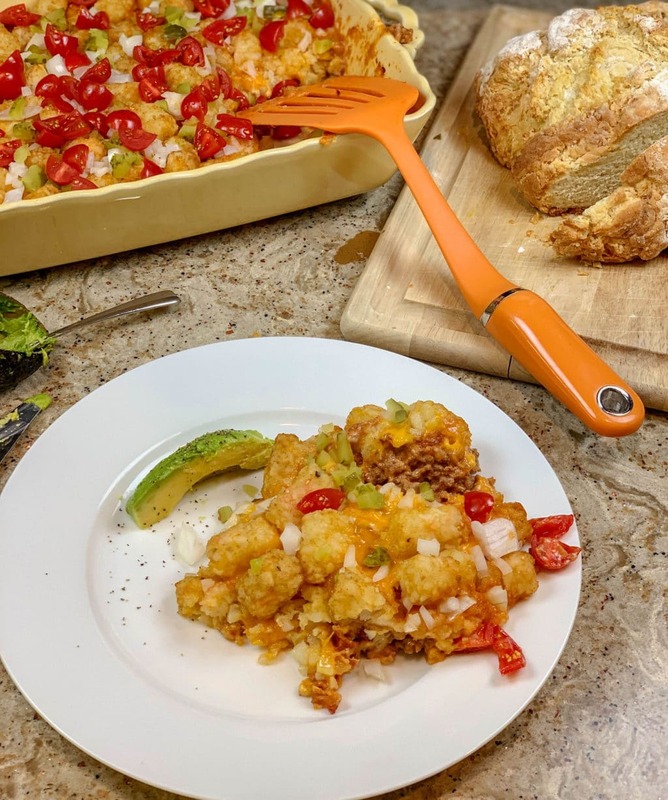 Top with the frozen tater tots. Bake uncovered for 35 to 40 minutes or until bubbly. Top with tomatoes, pickles and remaining onion. This casserole is to die for. This was the first time I had made this. 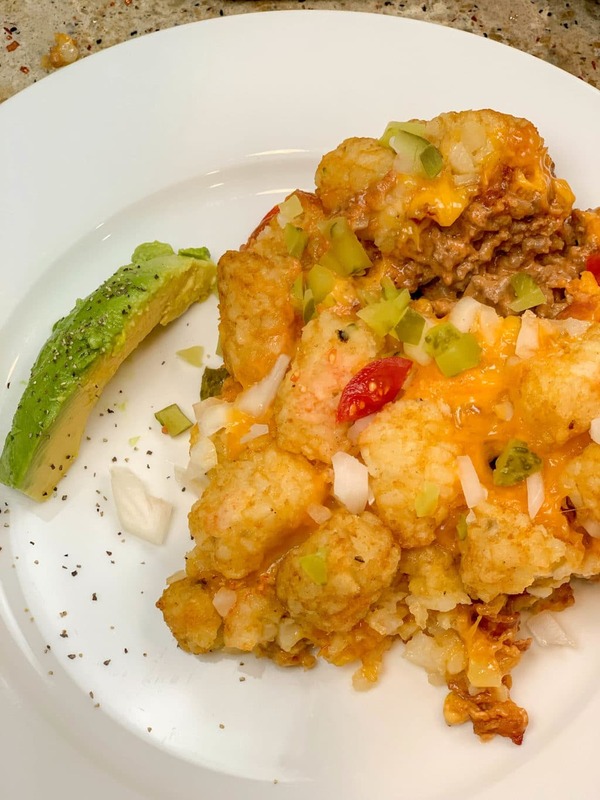 It was very easy to make and tasted just like a cheeseburger only with tater tots on the top. Everyone love it and I will surely make this again. The next day I reheated some in the oven and it was just as delicious. This casserole is really good. It’s a perfect casserole if you want a cheeseburger and fries. The meat with the Velveeta cheese is like the perfect burger. 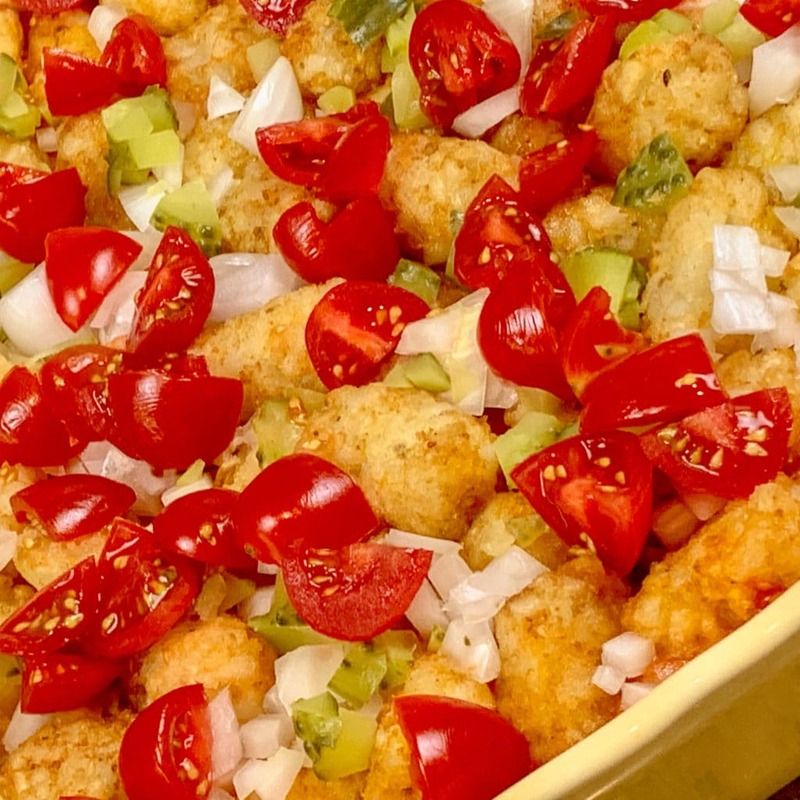 The tater tots are a great substitute for the fries, but what really brings it forward is the pickles and tomatoes on top. It’s fantastic.